The Vyne in Hampshire has at its core the remains of the great Tudor house constructed by William, 1st Lord Sandys, Lord Chamberlain to Henry VIII. The King visited four times and the chapel and the long gallery are amongst the most important surviving examples of Tudor interiors. From the 1650s the house was owned by the Chute family and they left their mark by reducing, remodelling and maintaining the building over the following centuries before donating it, with its surrounding estate of over 400 hectares, to the National Trust in 1956. By the 2010s severe problems with the roof made action to preserve this precious place imperative. Floods were becoming a regular occurrence, Tudor chimney stacks were liable to collapse and damage was occurring to internal decoration with a risk also to the contents. In some cases items had to be moved to safe storage to protect them and the presentation of historic room arrangements was compromised, such as with the dismantling of the hang of an important set of chinoiserie tapestries woven at the Soho Factory in London circa 1720. 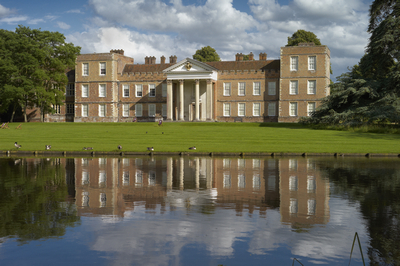 The National Trust made a commitment to undertake the works in 2015 and a major fundraising campaign was put in place. The decision was taken early on that the house should remain accessible to the public throughout the works, which were projected to last for eighteen months from the summer of 2016, but to go further than any other previous comparable re-roofing in the extent of access to the roof itself. The latter was a bold decision as it added substantially to the overall cost and would have to be recouped through visitor income and extra fund-raising. A further risk, in terms of both finance and impact on visitor enjoyment, resulted from the first floor rooms of the house being inaccessible during the period of the project, with much of the collection therein displaced to the remaining, ground floor rooms. In order to counteract this it was felt imperative that the visitor offer in the house should be dramatically enhanced, with an ambition to have a lasting, meaningful impact on the place thereby. It was a pre-requisite that this work be grounded in research, and advantage was taken of existing partnerships with Oxford and Southampton Universities. Dr Oliver Cox and Professor Jeanice Brooks gathered scholars with relevant interests and brought them together at The Vyne where discussion and debate led to the conclusion that the focus should be on the visit by Henry VIII in 1535, a critical moment for the King and the English Reformation. 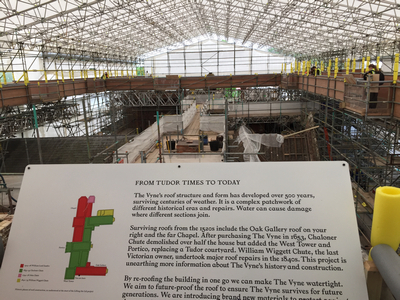 In order to understand the house as it is now and the works being undertaken, this would be combined with the story of William Wiggett Chute's 19th century attempts to preserve and enhance the Tudor aspects of the house, plus a look at what a major re-roofing such as this entails. Dr Lucy Kaufman, then of Oxford University, evoked the potency of Henry's visit with Anne Boleyn in 1535: the need to entrench Protestantism and secure the loyalty of key nobles, the vast numbers in the King's retinue, the pomp and pageantry, tented encampments, music, gossip, politics, religion and hunting. Working with exhibition designers, Skellon Studios, we evoked this through woodcut-like drawings bedecking the protective hoarding and interpretation boards, and we set up a dynamic display in the Stone Gallery on the ground floor. Tapestries of the period were used to create an animation illustrating court life on a progress, and were powerfully combined with changing symbols of the Kingrs"s power and a soundtrack of "Jouysson Vous Donneray" (Fulfilment I will give you) by Claudin de Sermisy (c.1490 - 1562) which was included in Anne Boleyn's own songbook. The King and Queen were reported to be "very merry in Hampshire" and this was, as Lucy pointed out, just about the last point in her tragic life that Anne was happy and secure: she was pregnant again, the King still adored her, Protestantism (to which she adhered) was in the ascendant and the rumours and plots against her had not yet started taking effect. In the rooms preceding the Stone Gallery, to set the scene for the whole visit, the process of packing and protecting in readiness for the works was highlighted, with displaced treasures from around the house stored on open display and advantage taken to present key items in focus. Particularly effective was the way the project curator, Katherine Allen-Kinross, arranged mirrors and light fittings, cleverly combining practical storage with an artistic installation. Following on from the Stone Gallery, the Chute family's great enthusiasm for the Tudor house was celebrated with original documents recreated, the principal drawing room (the Saloon) shown as it was in their time and the Dining Parlour set up for a family meal, a conjectural conversation playing in the background about the sacrifices required to preserve the place. The dramatic finale of the visit to the interior was provided by the chapel, a space described by Professor Maurice Howard as being "of a magnificence not recorded outside the royal palaces of Tudor England". Working with academics, choral singers, sound engineers, textile and silver historians and our exhibition designers the space was set up to be as accurate as possible for 1535 and a Mass was recreated so that it could be experienced by visitors just as it would have been by the King. Choreographed by Professor John Harper of Bangor University, leading expert on liturgical music and sacred history, each part was recorded separately - the priest and deacons at the altar, the chants from the Gentlemen of the Chapel Royal in the stalls, three-part music sung by the Children of the Chapel Royal and the organ. The only manuscript in which relevant music survives belonged to Henry VIII and this was the first time it had ever been recorded. Once done, specialist sound designers ensured that each part emanated from the right part of the chapel so that when standing in the room it was as if the service was in progress. The result was electrifying - pretty much as close as possible to stepping back in time. The National Trust are spending 5 million Pounds repairing the roof of this beautiful house. They have installed a walkway above the work, accessible by lift. It is then possible to look down on all the different rooves and chimneys and watch the amazing craftsmen working. It is a once in a lifetime experience for when the job is finished in a few months time it will be several hundred years before it will need repairing again. I cannot tell you how FASCINATING this experience is! Go now...do not miss this chance and while you are at it buy a tile and customise it for posterity. (Tripadvisor, 8 October 2017).